A top county councillor has backed a nationwide awareness campaign to encourage drivers to slow down around horses. 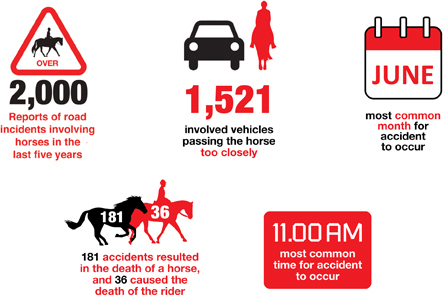 The ‘Dead Slow’ campaign, by The British Horse Society, calls on drivers slow down to 15 miles per hour when they encounter horses on the road, and to give riders plenty of room. Cllr Eddie Johnson, Essex County Council Cabinet Member for Highways and Transport, threw his weight behind the campaign. He said: “As we come into the summer months, horses become a common site on many of Essex’s rural roads as riders enjoy the warm weather and beautiful scenery. “Horses and drivers should be able to share the road without incident as long as everyone follows some simple rules. Statistics show that June is the most common month for accidents involving horses. The British Horse Society has received more than 2,000 reports road incidents involving horses across the UK over the past five years. More advice for drivers and horse riders is available at https://saferessexroads.org/road-users/horse-riders/.